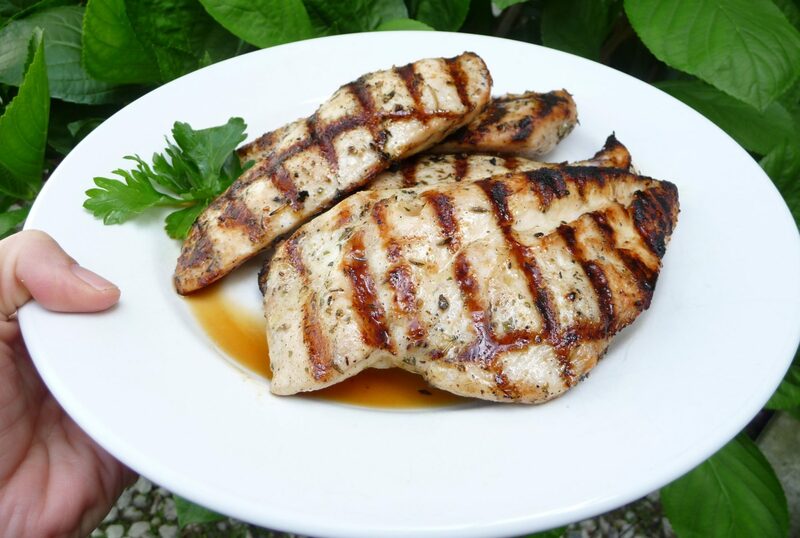 Grilled chicken is so easy and versatile! That’s why I always grill a double-batch and save the extras for other meals I’ve planned for the week. 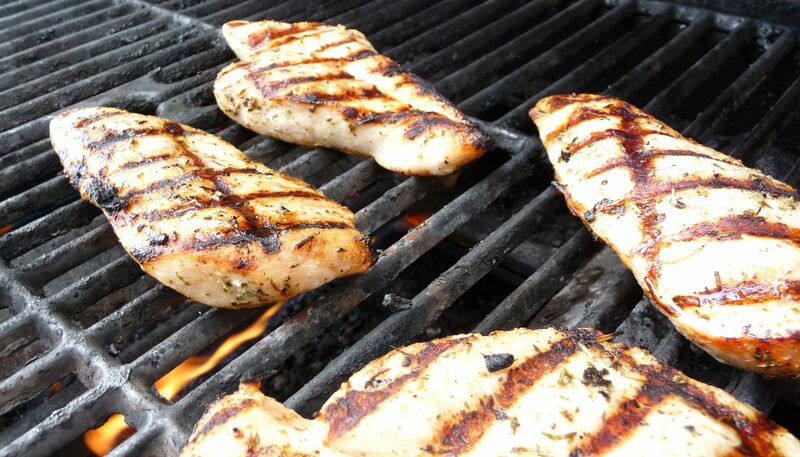 From salads and sandwiches to pastas and rice dishes, grilled chicken makes it easy to whip-up a healthy meal. What are you’re favorite ways to use leftover grilled chicken? Another favorite, is Grilled Balsamic Chicken – it’s especially delicious with fettuccine alfredo and can also be used to turn your favorite summer salad into a satisfying light supper. Cut each chicken breast in half lengthwise, to form two thinly-sliced breasts. or cut breasts into strips (chicken tenders). In a medium bowl, whisk together olive oil and seasonings. Add chicken and use a fork to turn chicken over a few times to thoroughly coat with marinade. Tightly cover bowl. Place in frig and allow to marinate at least one hour or overnight. When ready to cook, preheat grill to medium high heat and grill 2-3 minutes per side, until cooked through. We had lots of family over today. I made this chicken for our niece who has a sensitive tummy. She’s almost 12 years old and commented 4 times on how good the chicken was. For her to even compliment someone’s food is something!! We appreciate your simple, healthy, and delicious recipes! Thank you Kelly! Thank you, Kelly! Hope you have a blessed 4th as well. Just wanted to add that today there was one chicken breast left over. It was awesome cold on sandwich bread with honey mustard, mayo, and sliced, homegrown tomato! Made this tonight for my four kiddos. Excellent! And I made a double batch and froze the marinated chicken to cook for later. Thank you for all of your helpful tips. Im cooking this chicken for my class mates and, I’m wondering what the reciepe would be for 7-8 people. Hi Kelly. Just discovered your site today and have found some great tips and recipes, so, thank you! I was wondering how you think this chicken would turn out cooked in a skillet? We just moved into our first home and don’t own a grill yet 🙂 Blessings. Hello Kelly. This recipe looks wonderful. What heat level do you suggest for cooking these chicken breasts on the grill? Would medium do, or medium high? Thank you! I actually find that a lot of grill recipes don’t include the temperature/heat instructions, so this will be a very helpful guideline for a lot of the chicken recipes that my husband and I will grill in the future. We’ve been trying to find just the right setting to get the perfect bit of char, and now I think we have it. Have a wonderful day! Where do you buy your chicken breasts? I have such a hard time finding quality breasts that are affordable. Thanks you so much for responding. We unfortunately don’t have those stores near by but those are great suggestions. We do make trips a couple times a year towards the bigger city to stock up so I will definitely look next time I go. Right now we just use shredded chicken off of a whole chicken that I can get pastured locally but I definitely miss my breasts, especially during summer grilling!! Thanks. First, we really like this, and it’s become my go-to recipe when I need to cook chicken breasts by themselves! If I don’t want to grill, I follow the cooking directions you list for the “Date Night Chicken” recipe (brown in skillet heated to medium high until golden brown, then flip, and continue cooking until golden brown on the second side, about 2-3 minutes per side). For benefit of other cooks who are hesitant to depart from a recipe (as I was until very recently!) I wanted to add a “formula” to adapt the marinade seasonings to whatever you have on hand or feel like eating: for each pound of meat use 1.25-1.5 teaspoons of seasoning, using no more than 0.5 teaspoons of any one spice. For example, when cooking at the home of a relative who didn’t have all the seasonings listed, I used 0.25 t each of dried basil, oregano, garlic powder, regular salt (no sea salt available), and 1/8 t pepper. The chicken tasted great! Now I can’t help thinking of more combinations… Time to buy more chicken!